When twenty-nine-year-old Cynthia Galbraith struggles to come to terms with her traumatic past and the realities of prison life, a prison counselor persuades her to write a personal journal exploring the events that led to a life sentence for murder. Although unconvinced at first, Cynthia finally decides she has all the time in the world and very little, if anything, to lose. She begins writing and holds back nothing: sharing the thoughts she hadn’t dare vocalise, the things that keep her awake at night and haunt her waking hours. 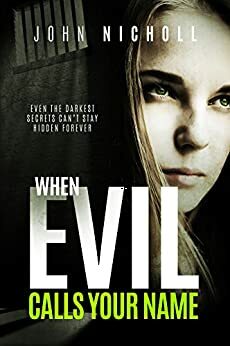 When Evil Calls Your Name is the second book of Dr. David Galbraith., and the title fits perfectly for the novel. The story is told by Galbraith’s wife, Cynthia, as she spends the remainder of her life in prison. Her prison counselor had suggested that she write a personal journal in order to help come to term with her past and future, and she does so in such gripping detail, it makes you really feel for her. It’s a much easier read than its predecessor, White is the Coldest Colour. The storyline is smooth and free of plot holes. John Nicholl does, as he did in his debut novel, a wonderful job at weaving the story together. When Evil Calls Your Name is set at a very slow pace. We look into Cynthia’s life as she was an innocent young girl, suffering from losses and pain. It only makes sense–and delving into Cynthia’s mind, we see exactly how it’s effective–that she was brainwashed and verbally abused. And that’s what makes this thriller scary. Looking on the outside, it’s not so easy to see why a young woman can be so easily manipulated and molded to fit the image of an evil man. Only someone who has lived it and seen it can relate. As a former police officer and child protective services worker, Mr. Nicholl does well in explaining how it could be done. After the halfway mark, when we begin learning about Cynthia’s relationship with Galbraith, I felt sorry for her having to go through what she went through. She was understandably a weak-minded young woman, who fell to the charms of a man she believed to be caring. It’s writing such as this that makes me love to read. It takes a natural writer to be able to grab your psyche the way Mr. Nicholl does. I highly recommend reading White is the Coldest Colour first. It’s not easy to read, but still, wonderful story telling, and highly intelligent. I believe the first book is essential to truly appreciate the second. I can’t wait to find out what new novels Mr. Nicholl has in store for us next. I’ll get it as soon as I’m able! With my newfound obsession (weird, I should say–but in my defense, I’m writing one myself, so it’s also research!) of reading/watching serial killers, I’m sure I’ll love it! I read the description, and it sounds brilliant. Very insightful review. I do need to read White is the Coldest Color – it’s in my TBR list.